Do you mean Posen, or do you mean Posen? Well, do you mean New York, or do you mean New York? In that way, Posen is just like New York. When you say you are from New York, do you mean New York State or New York City. Most people actually default to New York City based on our common assumptions, but the State is much bigger and probably has more people overall. Here in America, we assume that if you say you are from New York, then you are from the city. Most people when they talk about the rest of New York either say "Upstate New York" or "near Buffalo" or their exact town to ensure they are understood. When my relatives came to America, they just listed Posen on their immigration forms. I'm sure your family did the same thing. The problem with that is that we just assume they meant the city of Posen, Prussia. However there are a lot of other cities in the greater province of Posen. In fact the Grand Duchy of Posen was about 11,000 sq miles large. About a fourth the size of New York state. It had a lot of cities in it besides the capital city of Posen in Posen. Cities like Kempen, Lissa, Rawitsch, Schroda, Bromberg, Gnesen, and Kolmar. To make things even more complicated and confusing, the Prussian Province of Posen was divided into two government regions: Posen in the south, and Bromberg in the North. So, the address of the City of Posen was actually something like Posen, Posen, Posen, Prussia. One hint if you are indeed looking for the city of Posen: the German word to look for is Stadt Posen. It means Posen City, just like saying, New York City. First off, you are in luck. There are a number of great online resources for Posen research, and if you write to the registration offices they are very helpful. The strangest part is that all the resources are in Polish, and you'll have to do some Google Translating to get around. After WWII Posen was given back to Poland. 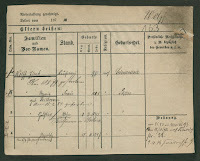 However all the records are still in German, so you are looking for are German language records on Polish sites. So, between English, Polish, and German you should be fine. 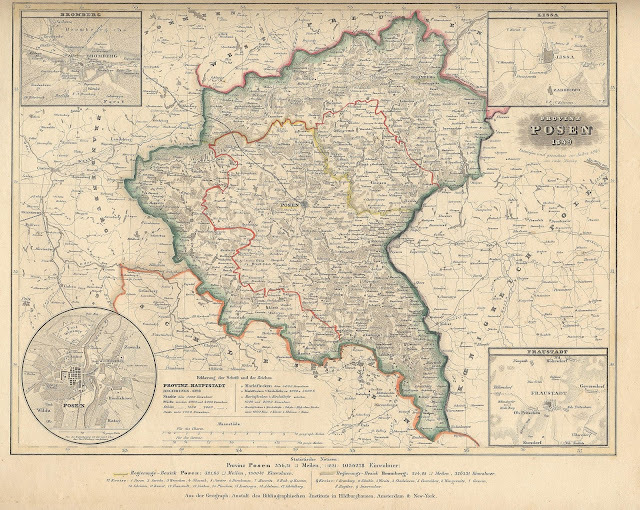 BaSIA: Your first stop is to visit the BaSIA Project, the Database of Archival Indexing System for all of Wielkopolska (Greater Poland region in west-central Poland). They have indexed over 4 million records, many of them with links to the original scanned images! There are birth, marriage, and death records. And not just for the city of Posen. All Posen! Poznan Project: While working with BaSIA you may also try the Poznan Project, which is a sister project dedicated to indexing and transcribing all the 19th century marriage records for Posen. It can be helpful to find the exact record, and then go back to BaSIA to narrow your search down to find the image links. Luft's Naturalized Jews of Posen: If you have any Jewish relatives, the book Naturalized Jews of the Grand Duchy of Posen in 1834 and 1835 by Edward David Luft is a really great resource. Posen City Cards: There is a treasure trove online. It is the City of Posen Population Census, and spans the years 1870 to 1931. These cards list out all the family members in a household along with their birth dates and places. Sometimes their death dates and address changes. These are amazing, and there is a searchable index! Now, these are only for the city of Posen, but like New York many many people ended up in the big city at some point. My own family was from Lissa originally, and they have a Posen City card for their time there. Keep searching. You might just discover an entire tree of family members you never knew about! 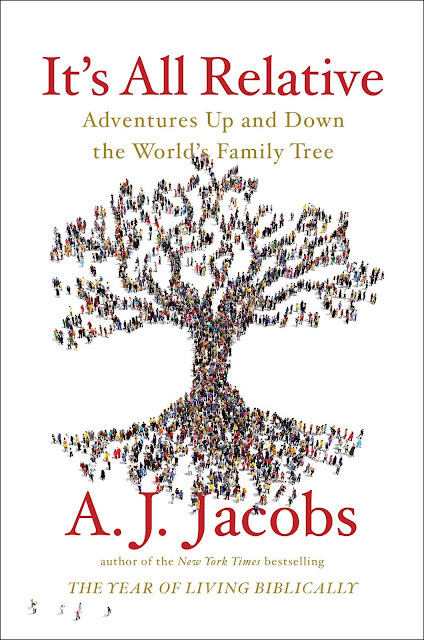 My Cousin AJ Jacobs Has Written Another Great Book! I really love reading books by the author A.J. Jacobs, and have avidly consumed most of his written works. I only say "most" as I'm sure some article he wrote for a local newspaper when he was 10 has probably escaped my attention. In any case, one of the things I like best is that his smart and sarcastic insights are what I wish I could aspire to if I was any good at writing myself. His prose resonates with me, and his topics are mysteriously in-tune with my own life (yes, I too read the entire encyclopedia when I was in grade school). 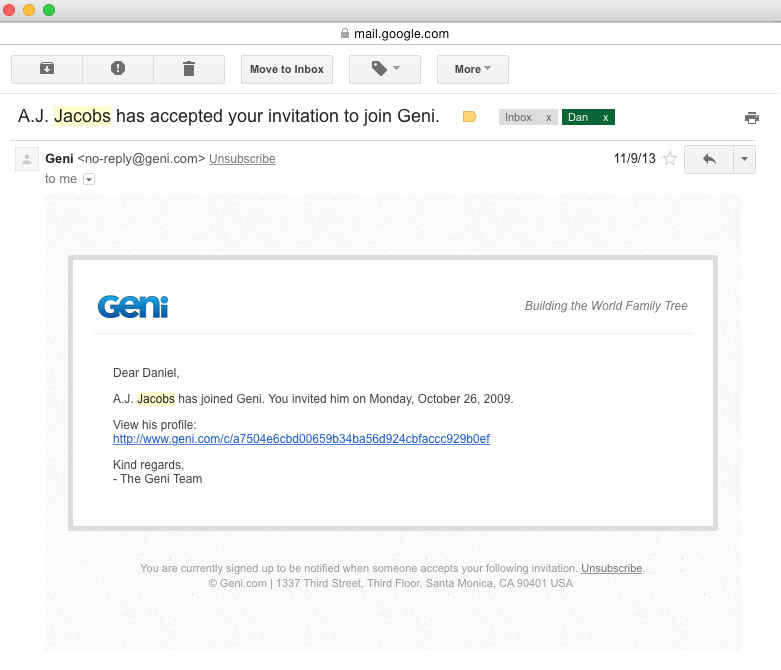 In 2009 I briefly corresponded with him, and on 26 Oct 2009 I invited him to join the big family tree on Geni. 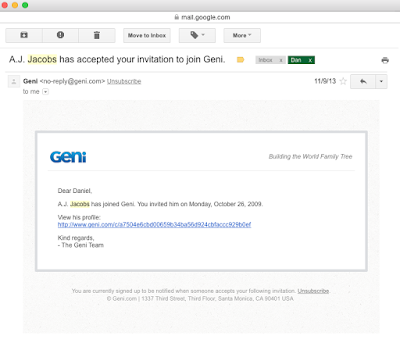 A mere four years later on 9 Nov 2013 I got an email from Geni telling me that he had accepted! That's lightning response speed in the genealogy world -- you all know what I'm talking about: that one super important close DNA match who still hasn't responded to your many attempts to contact them. Now, I'm not taking credit for getting A.J. involved in Genealogy. I'm not even suggesting he joined Geni at my recommendation. In fact, according to his story it was his eighth cousin Jules Feldman in Israel who was the tipping point. I only hope that my tiny grain of sand helped with the gravitational pull that eventually led to his involvement. Well, as AJ does when he does get involved, he really gets involved! He hit the genealogy world full steam and I'm not sure they really knew what hit them. 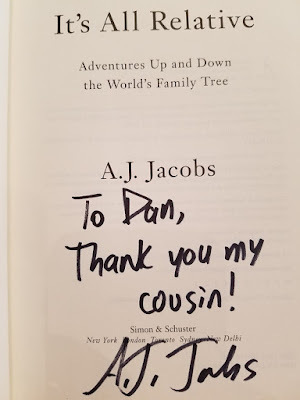 On 6 Jun 2015 he held The Global Family Reunion in Queens, New York, and in late 2017 he published a book about it all. I think the thing I like best about the book is that it is completely readable by anyone, and each chapter imparts an important lesson in a funny and down to earth manner. Gosh darn it, that's exactly what I've been trying to do with this site, and he just did it oh so much better! Game on! 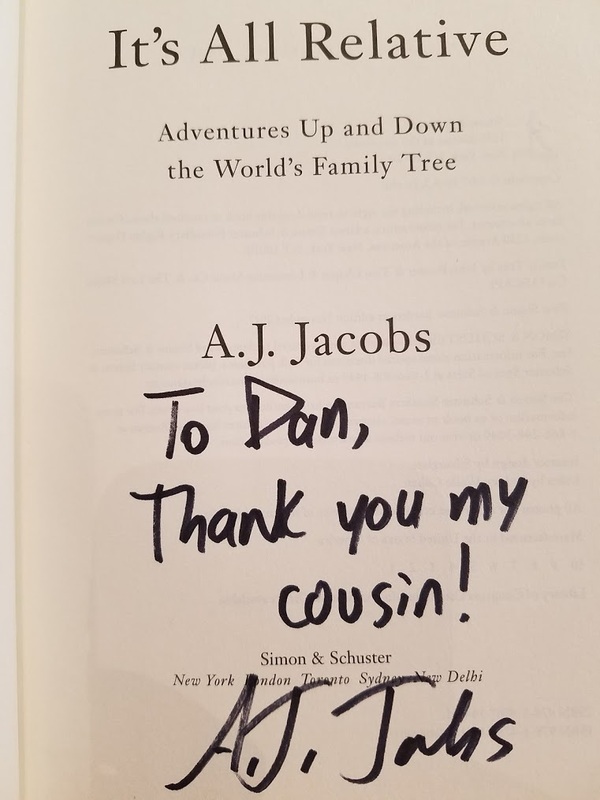 No no, thank you Cousin AJ. This book couldn't have been more timely and on-topic, and almost seems like it was written specifically for me -- even though I know that it wasn't! When I was a child, Memorial Day meant that summer was officially here. That it was time for beach, barbecue, beach barbecue, frisbee, and best of all... no school! We didn't have any close family who were lost in war, so we didn't have anyone to remember at a solemn cemetery visit. We skipped that, and moved directly on to the fresh ice cream and swimming lessons. Life was carefree and untouched. The meaning of Memorial Day was abstract and a little lost. Memorial Day honors those who have fallen in the line of service for their country. Not knowing any of those, we had to really stretch. We honored neighbor's cousins, friends of friends, veterans who died of old age, and even living veterans (forgetting that's what Veterans' Day is for). As I've dug into our family history, I have found some of the fallen. Not very many, to be sure, but the list keeps growing ever year as I track down second cousins, third cousins, and more. Genealogy has many surprises, and finding relatives who gave up their lives for their country is one of the heart-stoppers for me (others include infant deaths and holocaust victims). So on this Memorial Day here in the United States, I'm taking the time to list out my family's patriots who gave their lives in service to their country. Their home country is not always America, but it was the home country of my family. This is my personal memorial day, honoring those who've fallen in protection of their home and family. 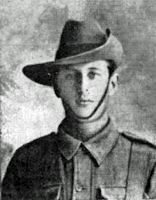 Private Leo Dorman Martyn of the Australian Infantry was born in Moruya, New South Wales, Australia in Decemember 1892. He was my grandfather Kessler's second cousin via the Lukes and Martyn families of Cornwall. 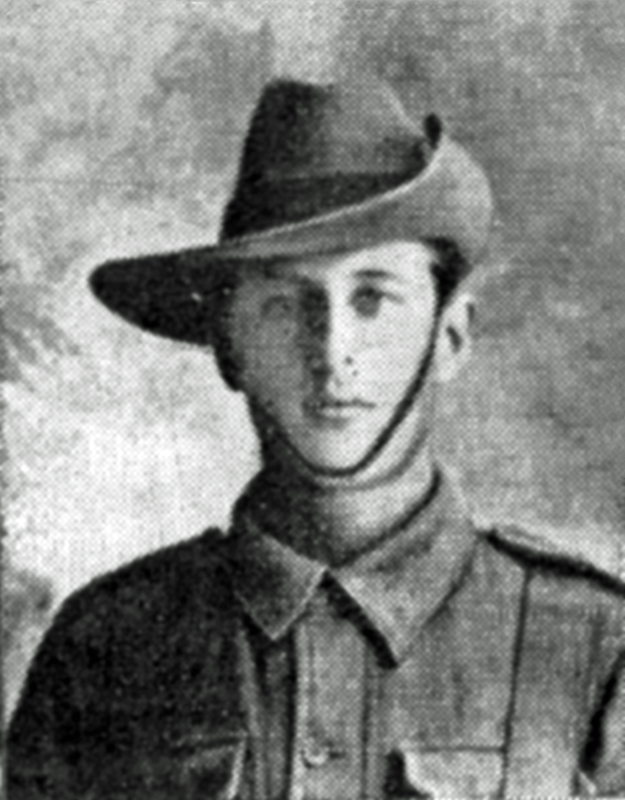 Leo was wounded on the first landing at Gallipoli in WWI on 25 April 1915. After landing, he was attaching at the top of the ridge about half a mile from the beach. He was struck by a bullet and fell backwards down the cliff, breaking his back. Leo died a few days later on 2 May 1915, at the age of 22, aboard a hospital ship as it was leaving the Peninsula. I've seen the 1981 movie, Gallipoli, with Mel Gibson, but now I really need to see the movie again. Urgently. With this new context, it will surely take on a new meaning to me. It will probably make me cry. I certainly didn't cry the first time I saw it back in the 1980s. 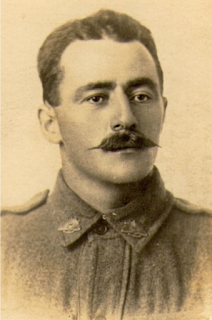 Leo Martyn is one of the honored heroes on the Roll of Honour each Anzac Day on April 25th. I only just discovered him recently, missing that date by about two weeks. Watch out for next year! Leo was 22 years old, unmarried with no children. Max Martin Wolff was my great grandmother Levy's first cousin. Max was born in Charlottenburg, Berlin on 5 July, 1890 to Leopold Wolff and his wife Ida Wolff, geb Lazarus. Max was an Unteroffizier (non-commissioned officer) in the Artillery, a member of the Reserve-Feldartillerie-Regimenter No. 5 (of Würzburg), 9. Batterie. His peacetime profession was listed as Studiert Mathematik in Charlottenburg, ledig. 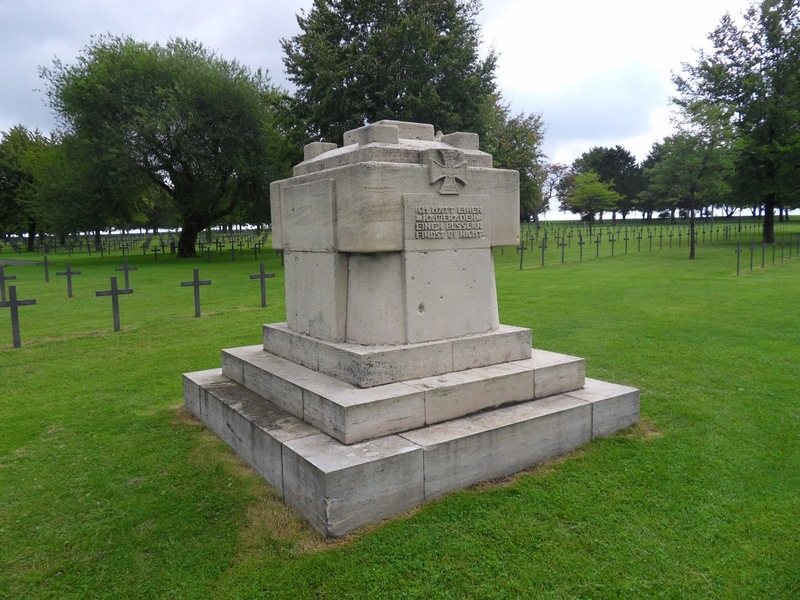 Max died on the field of battle in France on 4 Jun 1914 during the Second Battle of Artois. His death was on the third day of intense French artillery bombardments, launched to prepare for a June 6 infantry attack. He was first buried at Soldatenfriedhof Farbus. 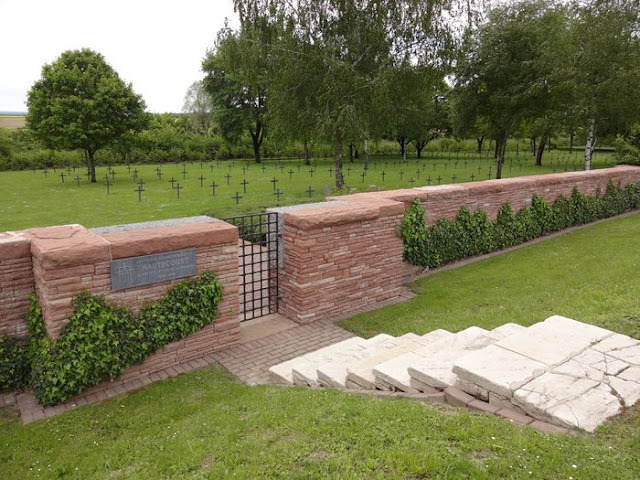 After the war, in 1919, all the nearby German graves were consolidated into the Neuville-St. Vaast German military cemetery, which is located about 8 km from Farbus. Also called La Maison Blanche, after a nearby farm, it s the final resting place for 44,833 German soldiers. 8,040 were never identified and are buried in a common grave. Max was 24 years old and unmarried. Canoneer Gustav Bodenheimer was my great grandfather Bodenheimer's third cousin, and a first cousin of Ludwig Bodenheimer below. Cousins Ludwig and Gustav were both from Waibstadt, so they knew each other. 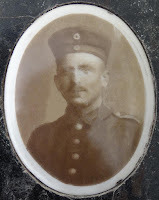 It looks like Gustav's brother Siegmund Bodenheimer also died in WWI, but I have not found any records on that yet. 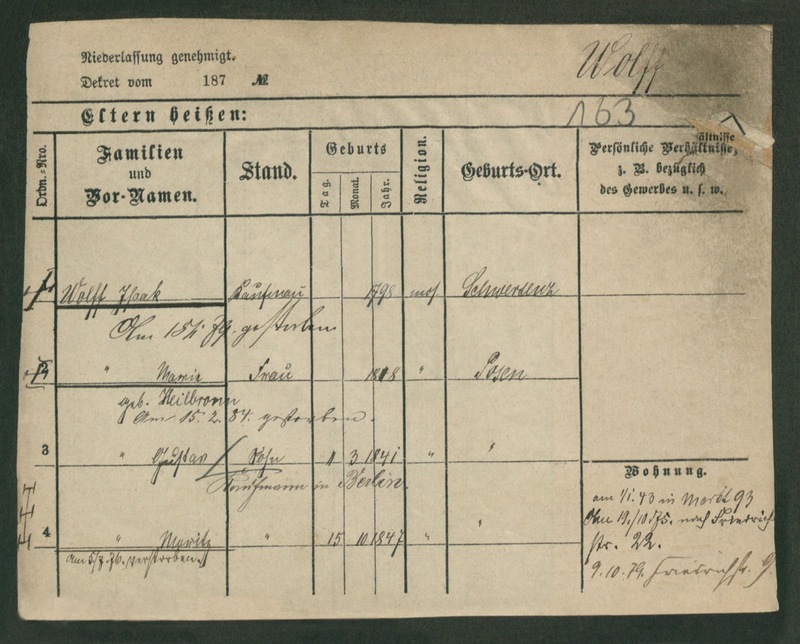 Gustav's death certificate reads, the commander of the field artillery regiment nr. 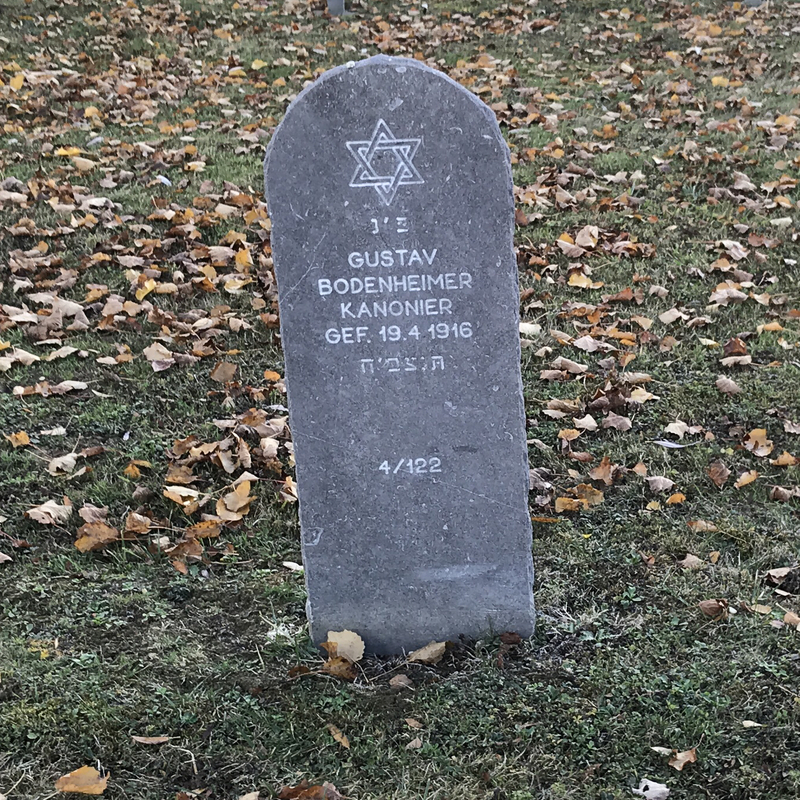 241 reported, that the canoneer of the 7th battery of this regiment, merchant Gustav Bodenheimer, 30 years old, Jewish religion, last residing in Frankfurt/Main, Elbestreet 31, born in Waibstadt, county Sinsheim in Baden, unmarried, son of the merchant Bernhard Bodenheimer and his wife Adelheid geb Friedberger, residing in Waibstadt, at the battleplace Merancourt-Ferme (Verdun) at the 19th April 1916 past midday at 4 o'clock due to a wound is deceased. Gustav is buried along with 7884 other German solders at German War Cemetery Hautecourt-lès-Broville near Verdun. Gustav was 30 years old and unmarried. Gefreiter (Corporal) Ludwig Bodenheimer was also my great grandfather Bodenheimer's third cousin -- a first cousin of Gustav mentioned above. I'm quite certain my great grandfather never met him and probably never even knew about him. However I have tracked down living descendants of Ludwig and reunited our Bodenheimer family! Ludwig was born in Waibstadt, and died on the field of battle during WWI on 23 August 1918. He fought for Germany, and as I've read more of the history of WWI, it seems that the entire thing was a real mess and probably should never have happened. From a single page of German military history, it looks like Ludwig was in 1 Infanterie-Regiment 87 as a Gefreiter, (Verlustmeldung 1874). That German regiment was stationed out from Mainz, only about 60 km south west from Bad Nauheim. They were assigned to the 21. Division, which was at Schlacht Albert-Péronne from 22 August 1918 to 2 Sept. So, from that, I can tell that Ludwig fell on the 3rd day of the Second Battle of the Somme, likely at the Second Battle of Bapaume. While his body may be in a grave at Fricourt, a commemorative plaque to honor him and the other fallen of his hometown of Bad Nauheim was placed in 1921. Sadly, during the Nazi period, his part of the memorial plaque was defaced as he was Jewish. I've tried to do as many Photoshop tricks as I know to clean up the photo, but as you can see it's still a bit mangled. 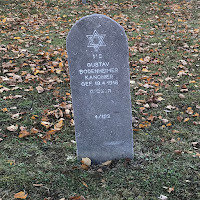 Many Jews fought for Germany in WWI, which is one of the reason that they didn't immediately leave when Hitler came to power -- they were decorated veterans or families of the fallen. What could be more German than that? His wife, what Americans would call a gold star widow, was killed by the Nazis on 30 September 1942 in Treblinka Concentration Camp. Ludwig was 39 years old, married with two children. Lance Corporal William Sendall Streeter was my grandfather Kessler's 2nd cousin via the Lukes family. Both of their mother's were Lukes, and first cousins at that. He is not blood related to Leo Martyn listed above, William is the great nephew of Leo's great aunt -- so basically second cousins by marriage of the Lukes and Martyn families. William was born in Addington, Christchurch, New Zealand and somehow ended up in Perth, Australia as a young man, probably looking for work as a miner. On January 9, 1917 he enlisted in the Australian Army. He joined the 44th Battalion of the Australian Imperial Force, Service Number 3351. He headed for England in June of 1917 and saw battle at Flanders Field and other places. The 44th was on-hand the day the Red Baron was shot down near Vaux-sur-Somme on 21 April 1918, and the current theory is that the Red Baron was shot down from the ground by Australian forces. After that, in September 1918, he was promoted to Lance Corporal and the 44th joined the Americans at the Battle of St Quentin Canal in France. He was killed in action on the first day of the main assault, 29 September 1918. He was buried 1,300 yards South of Bony, just West of the Road (approx). After the war, his grave and others was moved to the main Bellicourt British Cemetery. William was 30 years old, unmarried without children. My mother's first cousin is probably the closest relative we've lost in war. 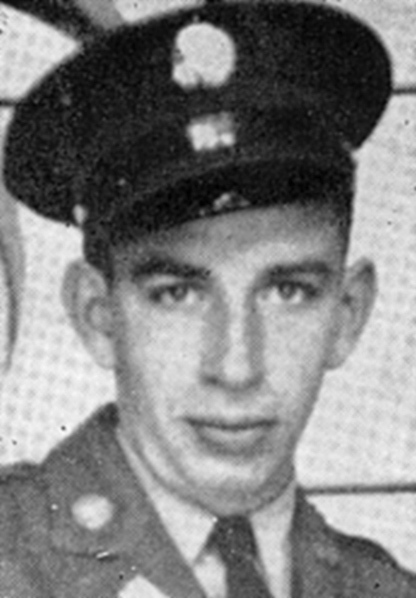 Corporal Edward John Fry, Jr. was killed in action in Italy during WWII. He was born in Garrison, Benton County, Iowa on 3 December 1922. 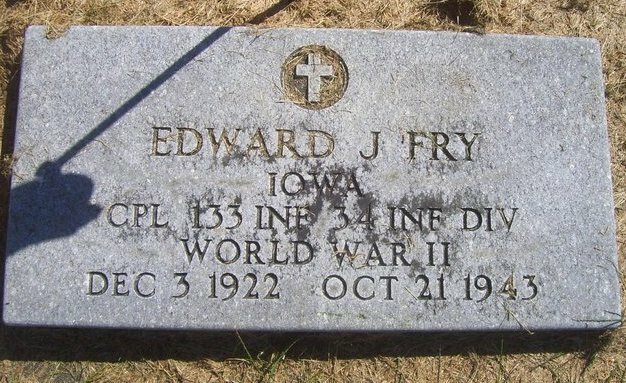 Edward Fry enlisted in the army on 3 October 1941 and went overseas with the first American troops following Pearl Harbor. He was in the US 133rd 34th "Red Bull" division, and after some training in Ireland they shipped out to North Africa. News that he was wounded arrived in Iowa in June 1943. At that time his division was securing the Chougui Pass near Eddekhila, Tunisia in preparation for the invasion of Scilly. 9 September 1943 was D-Day in Italy, as US troops landed at Salerno. It appears that Edward had recovered enough from his injuries to join his regiment as they crossed the Volturno river in Italy to secure the town of Alife. He was killed in action near Alife on 21 October 1943. Edward was 20 years old, unmarried with no children. He was born in Tama County, Iowa on 5 December 1917 and was Killed in Action on June 3, 1944 in Italy during the Battle For Rome, most likely near the town of Lanuvio , Italy as part of the 133rd Infantry Regiment, 34th Infantry Division. Harris is a little more distantly related to me, as he was the first cousin of Dean Gilliatt's wife. Dean is the next entry. Harris was 26 years old, unmarried with no children. This is probably the story I know the most about, and I need to sit down and properly write the entire case up. It hit me the hardest. 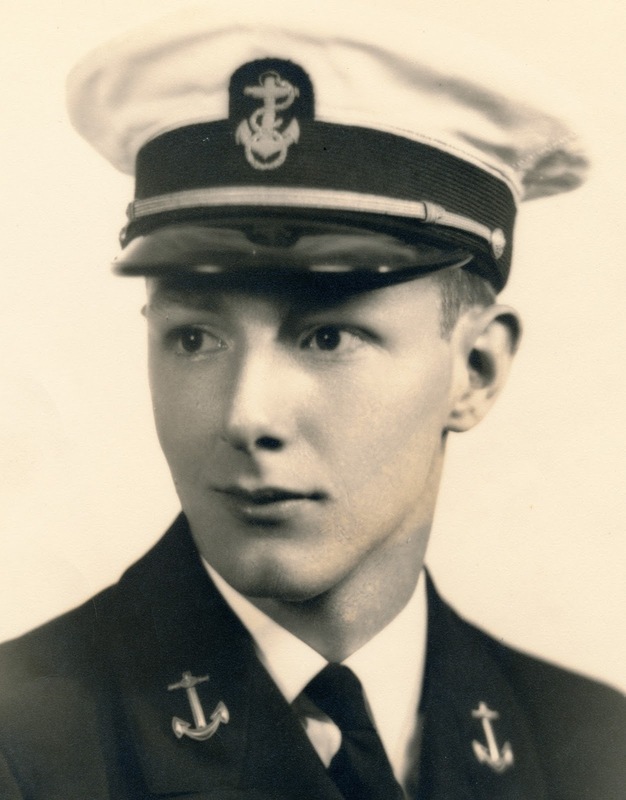 Dean Willis Gilliatt was born in Benton County, Iowa on 6 December 1920. He is my great uncle, Edward George Fry's first cousin twice removed. 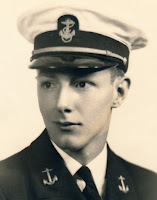 Edward Fry is indeed the father of the Edward Fry listed above, so that also makes Dean the second cousin once removed of Edward John Fry, Jr.
Dean was a Naval Aviator, flying off the U.S.S. Gambier Bay. He was killed in action off the coast of Saipan during the Pacific campaign. On 19 June 1944, the Wildcat fighter plane he was flying wasn't properly trimmed for takeoff and he crashed into the sea as all his shipmates watched in horror. His wife got the news of his death on the same day that his daughter was born. Dean was 23 years old, married with one child. 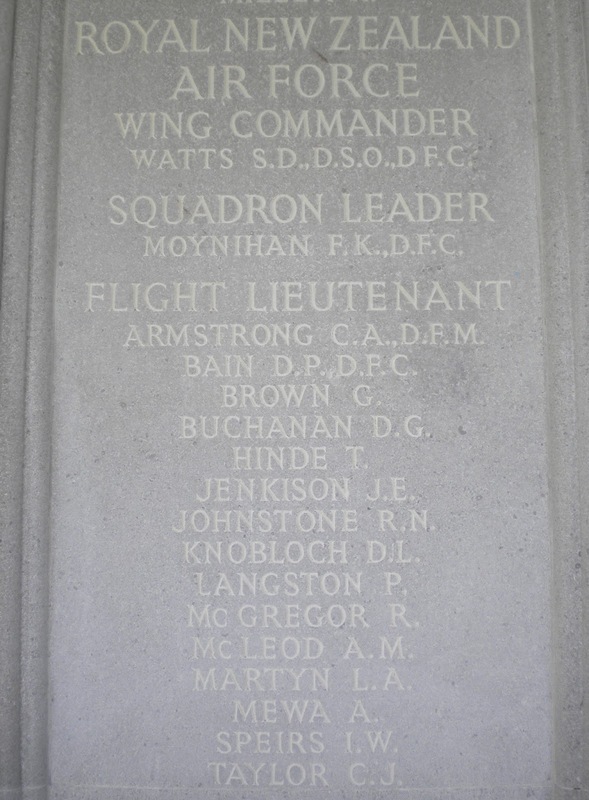 Flight-Lieutenant Leslie Arthur Martyn was my grandfather Kessler's second cousin. I doubt they ever met, and I don't have any pictures from that entire branch of Martyn cousins. Leslie was born in Kumara, New Zealand on 30 March 1911, the son of Edward Martyn and Jessie Andrews. He was one of ten children. On 21 November 1944, his Lancaster Mk.I NN745 AA-A took off at 13:46 with him in the pilot seat. This was a three-aircraft operation to lay mines in the Oslo Fjord. Two aircraft planted their mines in good visibility and without opposition. One aircraft captained by NZ417082 A/F/L L. Martyn, failed to return. All seven crew are commemorated on the Runnymeade Memorial. Leslie was 33 years old, and as far as my research shows no wife or children. Thomas Burton Lukes is my mother's third cousin. I don't think she ever knew about him, as I'm not sure she even knew or met all her first cousins. 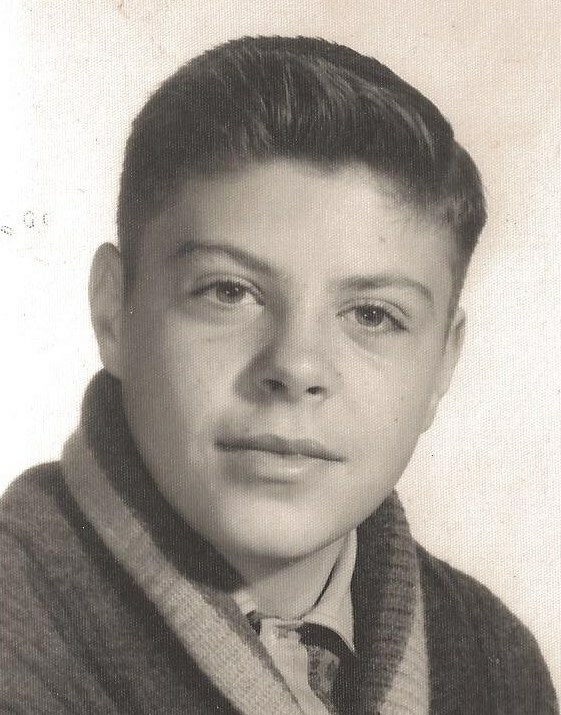 Thomas was born in Waterford, Pontiac County, Michigan on 18 December 1947 to my grandfather's second cousin, Thomas A. Lukes. His grandfather, Thomas B. Lukes was my great grandmother's first cousin. That's how cousining works. Thomas was a member of company A, 1st Battalion (Mechanized), 50th Infantry which served in Vietnam beginning on 22 September 1967. Thomas's tour of duty started 27 February 1968. On day 137 of his tour, 13 July 1968, Specialist 4th Class Thomas Burton Lukes and another member of "A" Company (Ronald Pillow) were killed near the base of Cay Giep Mountain (about 14.346353, 109.085670) in Binh Dinh Province by a 105mm artillery shell that had been modified as a pressure detonated mine. Death was instantaneous. Thomas was promoted to the rank of Sargent posthumously, and awarded the bronze star for meritorious service. He is honored on Panel 52W, Row 23 of the Vietnam Veterans Memorial in Washington DC. Thomas was 20 years old, unmarried with no children. I took an informal poll the last few days, with a sample size of about 4. Many people have been very lucky just like me. They didn't have any family members who were killed in wartime. They were able to enjoy Memorial Day without thought or pain. They honored the memory of those who've given their lives to protect our way of life, but it didn't really hit home. It wasn't really real. While I still can't even imagine losing a son, brother, father, or close friend; this growing still hits me where I live. It's real to me. The lesson here is that genealogy makes history relevant and relatable. Memorial Day is not an abstract concept now. It's a real thing, and as you find your connections to history through genealogical adventures, you too will discover how many new things really matter to you. Truly matter.